Like many other Crime Stoppers programs, ours is deeply involved with young people. We help set up and sponsor Campus Crime Stoppers programs in area schools. Some of these programs are in individual schools and some entail whole school districts. The purpose of these programs is to provide students a safe place to give information they may have about drugs, guns, vandalism, thefts, or other crimes in their schools. The programs are set up much the same way as our Crime Stoppers TIPS Hotline and are overseen by a faculty administrator or school resource (police) officer. The student board raises funds, publicizes the program and approves rewards. In 2006 we helped establish new programs in the Lee’s Summit School District and in Wyandotte High School in Kansas City, Kansas. There are active Campus Crime Stoppers programs in many other areas of the metropolitan area including Raytown, Independence, Louisburg, Kansas, North Kansas City, and many other schools. In 2007 we established a program with Hickman Mills School District. 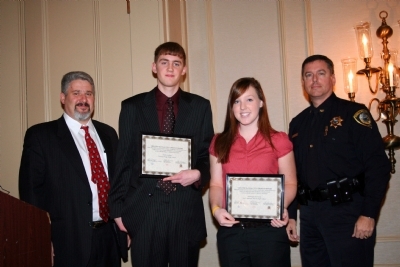 In addition to this program, the Greater Kansas City Crime Stoppers TIPS Hotline partners annually with the Metropolitan Police Chiefs and Sheriffs Association in a scholarship essay contest. The contest is open to any high school senior in the metropolitan area. Two winners are selected by a group of judges and each winner, one from each side of the state line, receives a $1,000 scholarship to the college of their choice. These are just two ways our program shows its concern and support for the children of our community. If your school or district might be interested in starting a Campus Crime Stoppers program feel free to call the Crime Stoppers Coordinator at 816-960-6800. As another service to the kids of our community, the following two documents are available for printing or downloading by parents. These questionnaires will help law enforcement in the event that a child might go missing or be abducted. Please fill them out completely and keep them in a secure place. Antioch Middle School - "Spartans"
Congress Middle School - "Cougar"
Eastgate Middle School - "EGeagles"
Lakeview Middle School - "Lynx"
Maple Park Middle School - "Vikings"
New Mark Middle School - "Stars"
North KC High School - "Hornets"
North Platte Schools - "NPHS"
Northgate Middle School - "Gators"
Oak Park High School - "OPHS"
Park Hill High School - "Trojans"
Park Hill South High School - "Panthers"
Platte County Schools - "Pirates"
Smithville High School - "64089"
Staley High School - "Falcon"
Winnetonka High School - "Griff"
Kearney High School – "Dawgs"
Grain Valley High School - "GVEagles"
Lawson School District - "Cardinals"
Pioneer Ridge Middle - "PRExplorers"
Van Horn H.S. - "VHFalcons"
Wm. Chrisman H.S. - "WCBears"
Rockhurst High School - "Rock"
West Platte School District - "Jays"
J.C. Harmon H.S. - "Hawks"
F.L. Schlagle H.S. - "Stallions"
Lincoln College Prep - "Blue Tigers"
Manuel Career Technical Center - "Cardinals"
Southeast High School - "Knights"
Paseo High School of the Arts - "Pirates"
Northeast High School - "Vikings"
Northeast Middle School - "Titans"
Central High School - "Eagles"
Central Middle School - "Warhawks"
East High School - "Bears"
Success @ Anderson - "Phoenix"